We are lucky enough to have a beach pretty local to us, but even if you don't, the chances are you will be visiting one this summer either as a day trip or on holiday. Taking a baby to the beach can be fun as well as challenging, especially with older siblings as well. As part of our role as Huggies® Little Swimmers® ambassadors we have been challenged to 'get set, splash' this summer which really isn't hard. We love to be outdoors, the children love having the freedom to run around and water is all just part of the fun. Finn's little swimmers are the perfect beach companion for him - he can wear them in the sand without me worrying about keeping him covered or any nasty accidents and if he decides to crawl off and explore in the sea then I know that they won't swell up or inflate. The fun characters from the upcoming Disney© Pixar film 'Finding Dory' mean they look bright and fun in the sun and they are easy to tear off at the end of the day when it is time to take him home. I have put together a little video with my top tips for taking a baby to the beach - but my main tip is to be relaxed - eating a little sand doesn't do them any harm, the beach is full of shells and rocks and things to explore if you forget the buckets and spades, and as long as you have some wipes and some Huggies® Little Swimmers® in your changing bag you are pretty much set! 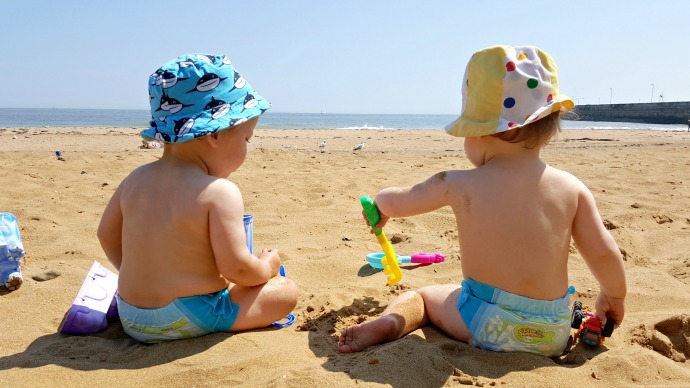 So what are your top tips for taking a baby to the beach?